A 23 year old male presents with 6 hours of central sharp chest pain, left arm heaviness and diaphoresis. He has no past medical history or relevant family history. He doesn’t smoke and is a social drinker. He denies any elicit substances. His vitals are: HR as per ECG, BP 128/67, Sats 97% on RA. His ECG is shown below. If this patient presented to a rural emergency department and you did not have a cardiac cath lab, would you thrombolyse? QRS’s: Not too tall/small, wide/narrow or abnormal morphology. 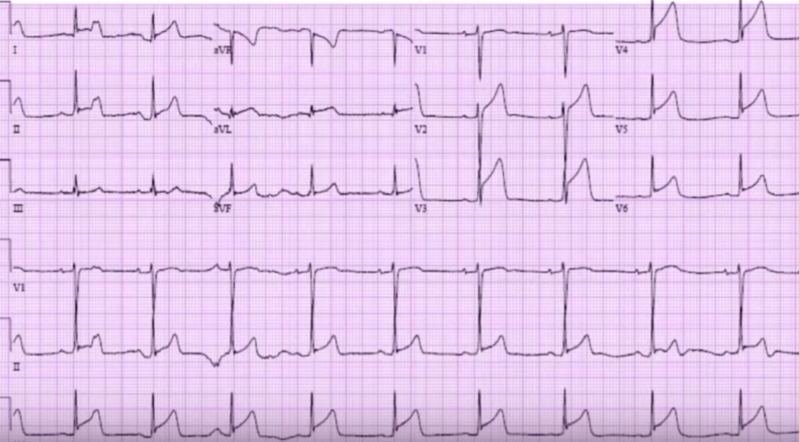 ST-T SEGMENTS: There is ST elevation in V2-V6, I, II, aVL, however, there are no reciprocal changes. There is a QRT sign where the T wave shoots straight up, that may indicate ischaemia. The T wave is as the R wave in V4 again indicating ischaemia. Is this an ischaemic ECG and would you Thrombolyse? There is diffuse ST elevation. If you look closely there is some PR elevation in aVR(may indicate pericarditis)but lets ignore because evidence is poor. There may also be some PR depression in II. What are the things that strongly favour STEMI? This ECG favours a STEMI. Yes even in a 23 year old. Following Cardiac Consult he would more than likely receive thrombolysis. As luck would have it for this young man, the retrieval service was on the ground in our hospital so he got choppered to a hospital with a cath lab.